Most impacts that make a crater make a round crater. This is because explosions expand in all directions equally. But when an incoming meteorite strikes the ground at a shallow angle — less than 15° above the local horizon — the resulting crater is no longer circular. 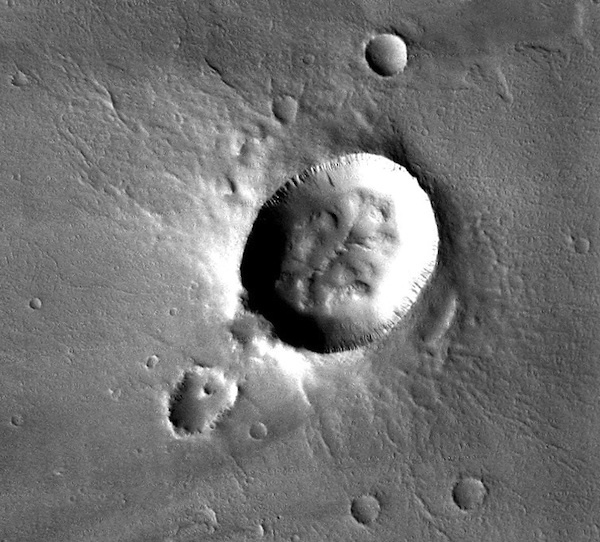 Low-angle impacts produce craters with an oval outline. And instead of a debris apron all around the crater, two "wings" of debris are flung to either side, making a butterfly pattern. (This is similar to what happens at double-impact craters.) On occasion, there is a smaller crater in line with the oval one and the wings; these may be caused by the impactor breaking apart just before hitting — or possibly the top of the impactor splits off and travels a little farther downrange before hitting. Elliptical craters with butterfly ejecta patterns make up roughly 5 percent of all craters on Mars. Similar craters are also seen with about the same abundance on the Moon and Venus. While scientists have studied crater-making explosions in detail, their understanding of what happens in an oblique impact is much less certain. Lots of work needs to be done still to fully understand this process.